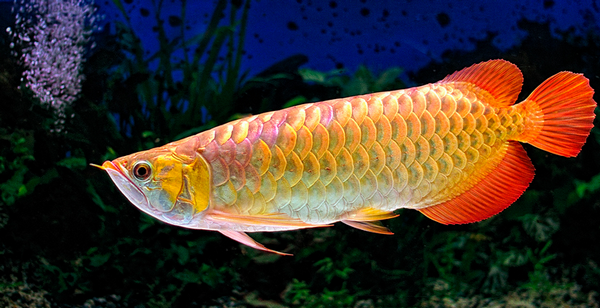 There are all sorts of great tropical fish out there who need a carnivorous diet like Arowanas, Peacock Bass, Cichlids, Goliath Tiger Fish and Piranhas. They can be exciting to keep, but meeting their nutritional needs can be more complicated than it first seems, and there are some specific health problems they can develop as a result of their diet. It's important to understand these issues in order to keep them healthy and happy. 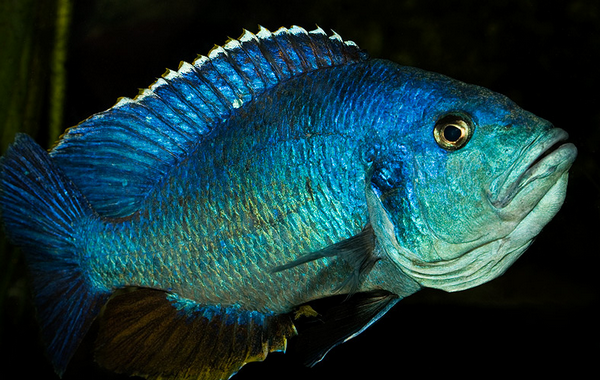 Many aquarists purchase carnivorous fish because they expect them to be exciting, but in fact they are often largely sedentary. What they need to get them moving is the opportunity to hunt and chase. This means that live food serves a dual purpose, encouraging them to exercise as well as meeting their nutritional needs. General live food products such as kelp and daphnia are suitable for small, shoaling carnivores who get plenty of exercise anyway by chasing each other around, but for larger, more solitary carnivores they make life too easy. In more intelligent species of carnivorous fish this can lead to boredom, stress, and consequent health problems. In this situation, the best thing to do is to provide your fish with other, smaller fish to eat. Some species also enjoy snacking on invertebrates, but you'll have to do your research to make sure that what you feed them is suitable. In either case, it's very important to choose healthy specimens, as carnivores can contract illnesses from their food. Find a good, reliable supplier and stick with them. Not all carnivores will want to eat live food as soon as you put it in the tank. Some prefer to take their time and may hunt their prey over the course of a few hours or even days. Occasionally they even make friends with their intended prey! Be prepared for all these eventualities and make sure you keep notes of how often and how much they eat. One thing many aquarists don't realise is that they can feed carnivorous fish the same food they eat themselves. A varied diet is the key to keeping carnivores in optimum health, so if you're eating a variety of meat and fish foods yourself, it's beneficial to share. Carnivorous fish can enjoy eating beef, ham, lamb, venison, fish and poultry, but these foods must be cooked first - raw meat may be more similar to what they'd eat in the wild, but it often carries pathogens. Boiled, roasted or baked meat and fish is fine, as long as it hasn't been soaked in a sauce. Basting with oil or honey is not a problem. Fried meat can be okay but is often too fatty. Avoid bacon and other highly salted meats. For larger carnivores, meat and fish can simply be dropped into the tank in pieces. For smaller ones, try suspending a piece of meat from a string so that it just breaks the surface of the water. Shoaling fish, in particular, will enjoy crowding around it and pushing themselves upwards to feed. Unfortunately, a carnivorous diet has a downside. 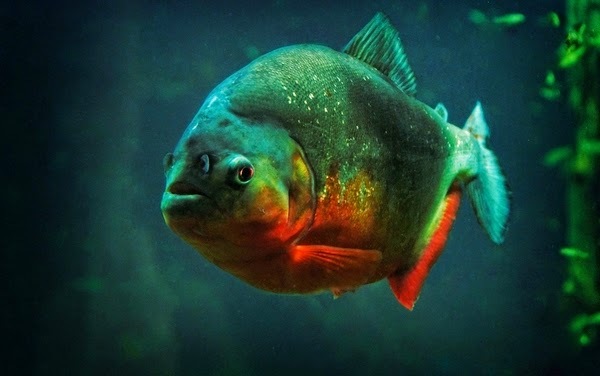 Because they don't have to work as hard to get food in an aquarium as they would in the wild, carnivorous fish often get fat. This is exacerbated by an excess of fatty food. Many popular live food sources are very fatty because they've been fed a diet aimed at making them grow fast rather than keeping them healthy. Their health problems can be passed along to your carnivores. The best way to tackle an excess of weight gain is to feed a strict diet of lean meat and fish. Try to give your carnivores plenty of stimulation through the provision of toys or shared activities, to keep them active. Some fish will move about more in response to rhythmic music played near the aquarium. Too much fat will make your fish more vulnerable to infection, tumours and heart problems. Carnivores often have digestive problems because, like humans, they have guts that evolved to cope with more vegetable matter than they now consume. As they are often happy to eat vegetables too if they have a high protein content (peas and beans are ideal), try feeding these occasionally. The extra fibre will flush out their systems and keep them in better condition. Most importantly, keep a close eye on your carnivorous fish to make sure that if they contract infections from their food they can be treated quickly. The great news about carnivores is that, if properly cared for, they are comparatively long lived. They are often intelligent and spending time with them can be extremely satisfying.